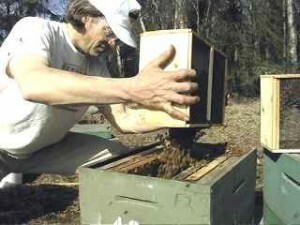 On this page I will show and tell you how to hive a package of Honey Bee’s. There are several ways to hive bee’s, I will tell you how I do it and some alternatives. First you should order your packages early and not get caught without. Mid February to mid March is a good time to get your orders in. I start communicating with my supplier in California in January to secure a shipment for me and the people I bring packages in for. 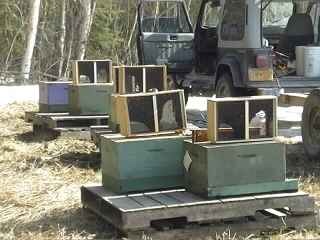 I like to Hive bee’s early in the spring around the first week in April. Sometimes later, depending on the weather. The earlier you can get a queen laying eggs the bigger the colony will be at the honey flow, (hopefully). Some local suppliers bring bee’s in at different times. Try to determine how many packages you will need, when you want them to arrive, and order them early. Check with several local suppliers to get the race of bee you want, the time you would like them to arrive and the location you would like to pick them up. Check out my link to Bee races and strains, at related links, to see what type of bee you would like to keep. Local Suppliers should be able to supply the three most popular strains, Italian, Caucasian, and Carniolan. Sometime before your packages arrive you should have your bee yard set up and ready for hiving your packages. I usually have mine ready a week before my packages arrive. I do not like my bees waiting for me to get ready, I feel I should be ready for them. 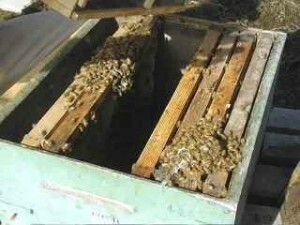 So have your bee hives set on their stands, with combs arranged in the supers, and inner cover and tops on. Now you are ready for the next step. OK, you have your packages and we don’t have the luxury of picking the perfect day to do the job of hiving. So we either do it the same day they arrive or do it the next day. A good day for me is a warm day with an overcast of clouds. With my experience a sunny day makes for excessive flying bees when hiving. Have some syrup mixed and in a sprayer. You may have to spray your packages if they fly to much or if they need to be calmed down. remember do not get the queen wet or cold. As you can see this day is sunny and a little sugar syrup is needed. Some people like to slam the package down and make all or most of the bees settle to the bottom of the package but you do not have to do this. It is up to you how you start the process. It is more gentle to not slam the down. how ever you do it first get the hive ready by taking the covers off and removing three or four combs from the center of the box. Next, spray your package through the screen on to the cluster of bees, if you feel you need to. It does calm them and can make them heavy and unable to fly. Now slam them down or not, it’s your choice and take the feeder can out of the package carefully. If you slammed the bees down you now need to take the queen cage out and place the queen in your chest pocket, to keep her warm. If you chose the gentle way, lift the queen cage out and lay her down with the bees adhering on to the remaining frames on your hive, as the picture below shows. Now it gets fun. Shake, rattle and roll your bees into the center of your hive. 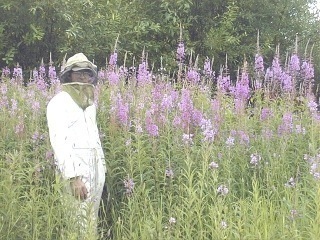 Try to get all of the bees into the hive. Some people like to bang the package on the hive in an attempt to get all the bees out. But, all you have to do is use your hand to bang them back and forth and then roll them out. You might have to do this several times before they are all out. 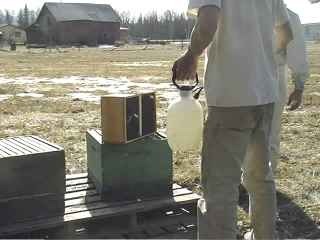 This way is much easier on your equipment and gentler on the bees that are already in their hive. 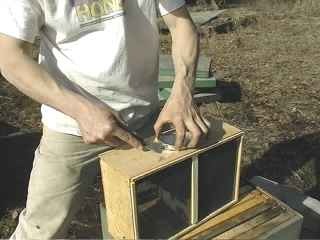 With your hive tool, spread the pile of bees in the bottom of the hive out even and gently place the frames that are out, into the hive. Let the frames settle down slowly, so as not to smash any bees. There is two things that you can do with the queen. you can release her into the hive or put the cage into the hive for a few days and release her latter. If you chose to release her at this time it is important to determine if her bees that are adhering to the cage has accepted her or not. If the workers have their noses in the screen or they appear to be trying to sting or get to her, they have not accepted her yet. The cage will need to be put in the hive for a latter release. Put the cage with the screen facing so the workers can tend to the queen, in the center of the hive, in between the 5th and the 6th frame. But if the workers are meandering around on the cage slowly and calmly more than likely they have accepted her and can be released and get her settled in sooner. Be careful if you release her so she does not fly away. Do not try to release her unless you feel like you have confidence. There are several ways to release her, here is how I do it. 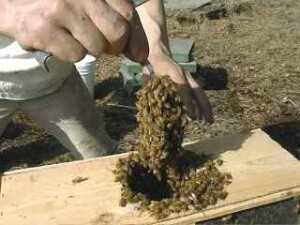 I brush the bees off the cage gently, remove the cork and immediately put my finger or thumb on the hole. Next I put the cage near the center in between the 5th and 6th frame, with the hole facing down in between the frames. I expose the hole while cupping my hands over the cage and watching to make sure she goes down. 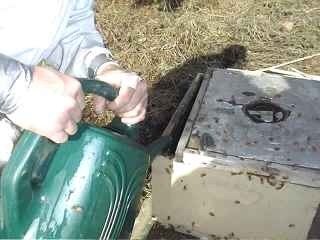 In the many years I have been keeping bees, I have only lost a couple of queens. When I came back to the hive the next day, the queen had found their own way to her colony. Sometimes their are two queens in a package, one in the cage and one loose in the package. She will be inclined to fly away if there is a loose queen in the package, or if she is not excepted yet. However you deal with the queen be careful with her, she is the most important member of the hive. On the picture above, notice the bee on the finger of the person releasing the queen. Nice bees, huh. Good luck and have fun. Now replace the inner-cover and hive top. To help keep down robbing install an entrance reducer so the entrance is small, this will allow the bees to defend themselves. The last thing to do is feed your new colony. There are a few different ways to do this. In the pictures above is a good way to do this. 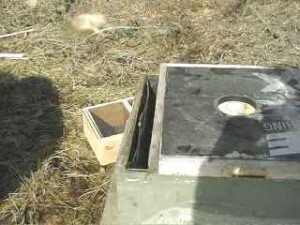 It is simply an inboard plastic feeder in place of one frame. A gardening water jug serves to fill the inboard feeder. You can click here to see how I feed my bees. At this time I suggest you also give them a pollen patty if there is not any pollen available for the bees to forage on. I mix pollen with honey or sugar syrup, put a good heaping large spoon full on the frames, covering it with heavy duty aluminum foil and then I put my baggy feeder on top of the foil. I put a little hole in the foil, just enough to let the bees get through to the baggy feeder. This foil helps to keep heat in yet allowing heat to transfer to warm the sugar syrup. Have fun, use your imagination and maybe you can come up with good ways to keep bees in Alaska. I would like to thank Ray Hodge for allowing me to photograph him hiving his packages. I had fun!